The Story of My Name! Every day something interesting happens to every one of us. Some of us are lucky enough to pay attention to the little “interesting” things which happen. Some of us are too busy to notice it. It all comes down to how you respond to, when something happens. The other day when I was on my way to office, I as usual, kept myself occupied with twitter and music, when a lady came and sat next to me. She was accompanied by her son who was around 5 to 6 years. He was very well behaved, sat quietly without pestering his mom. I was surprised. Such a well behaved boy, at such a young age! Just when I was thinking of how well he was brought up, I noticed that the boy was looking at my mobile and he said something to his mother. His mother smiled and said “No, you shouldn’t ask for others’ mobile phones”. I asked the lady what her son wanted and she told me that he wanted to know what model I was using. After giving him the information he wanted, I casually asked him, “What is your name?” He said,” I’m Adarsh”, with a smile. No wonder he was such a well behaved child, I thought. I told his mother that Adarsh was a very well behaved child for his age and lives up to his name, even at that young age. I added that he had a very nice name. The lady said that she actually wanted to name her son “Aman”. But her husband felt that Adarsh would be a better name. The poor lady had no other choice and had to give in to her husband’s idea. Just when the lady had finished with her narration, I realized that I’d reached my destination, I said bye to Adarsh and his mom, I disembarked and I started walking. 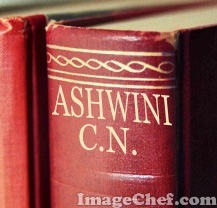 On my way, I was thinking of how I was named “Ashwini”. Since my sister was named “Swathi”, my mom had wanted to name me “Shruthi”. It so happened that I was born at the time when one star was setting and another star was rising. So when our relatives had come to visit me, they had asked my parents if I was born under the star “Ashwini” or “Bharani”. My sister, who was around 3 years old then, presumed that people had been asking my parents what they’d decided to name me. When my mother kept telling “Ashwini” she thought that, it was the name my mother had chosen for me. When our relatives had asked my parents what name they’d zeroed in, before my parents could reply, my Sister had proudly said “Ashwini”. I was told that everyone was surprised, for they did not expect a 3 year old to answer the question and they did not expect a 3 year old to give such a good suggestion. My sister did not know the difference between the Name and the Nakshatra, and she had decided that I would be called Ashwini. My parents were happy with the name and more than that, they were proud that my sister, my 3 year old sister was choosing my name. So it was decided, unanimously that I would be named “Ashwini”. I was silently thanking the lady I met. Had it not been for the explanation she had given me regarding the name of her son, I wouldn’t have thought about how My Sister chose my name. Wonderful memories. Just thinking about such memories would enlighten my day. Named after a Nakshathra! Oh My God. Read this post of mine. HaHaHa. I am sure you had a big laugh. Let me know. Thanks. Good post ……Nice reading experience ….Ash.. let your fire of writing takes you more heights…. Ashwini now i have also started wondering who named me.Look what you have done!